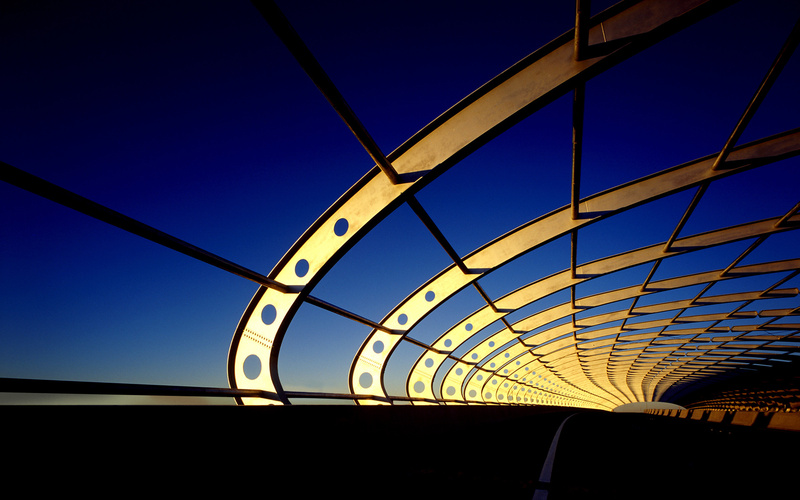 A Bridge of Curves | Click This, TAPG! 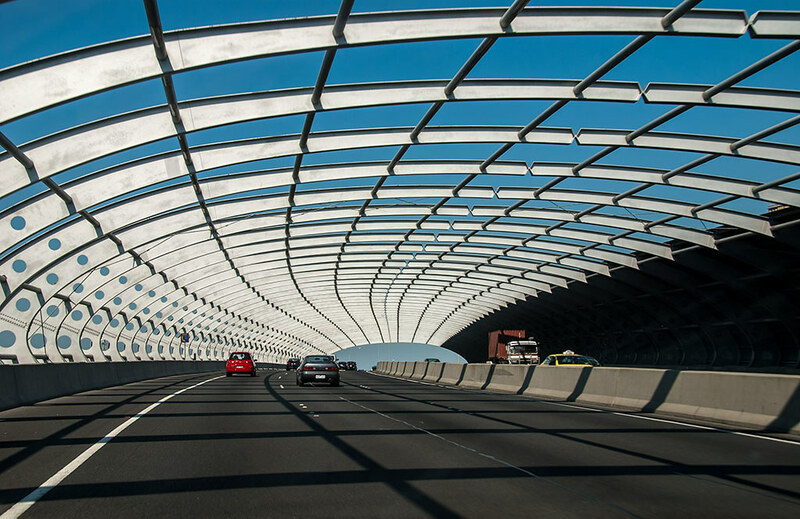 These curves are actually a sound barrier (or sound tunnel) on the City Link in the Melbourne, AU, suburb Flemington. My caption is a reference to the nearby railway station, Flemington Bridge, although, to me, it kind of looks like a cheese grater. Fitting, perhaps, since the yellow beam “Cheesestick” – part of Melbourne International Gateway – is close by. Very cool curves! Hard to believe it would cut the sound tho—interesting! Yes, this is quite neat. As for the function, I’m with you but, hey, who can understand those inscrutable engineers?! Very cool. Curious how was this photo taken, through the windshield of the car, a convertible…? Through the windshield. (I was a passenger 🙂 ). It really helps to have a clean windshield 🙂 Sometimes I wish I had a chauffeur… so many photographs I have missed, there just aren’t enough pull out areas for photographers! Love the looks of this. Nicely captured! Thank you, Amy! BTW, your Brooklyn Bridge photo for this challenge is killer! Seriously! Great perspective. Love the flag. Perfect in B&W. Rawls, very nice repeating patterns. They bring your eye right down to the opening at the end. Thanks, Tim! I was quite lucky to catch this in a moving car at a good spot. That said, IMO the following similar image is the best I’ve come across in cyberspace: http://www.e-guru.biz/images/arch/img18.jpg . Wonderful dawn light (I think), no traffic (or maybe good PS skills!) and a perfect capture of the horizontal bars for an outstanding perspective. (Interestingly, Microsoft apparently agreed as they had this as a Windows wallpaper for the AU market some years ago 😎.) Cheers! I like your photo and the one in the link. This sound-deadening feature is a fantastic concept. Thanks for teaching me something new today. Thank you, Allen and you’re welcome. I would have *never* guessed this was supposed to be a sound barrier. Only the good ole Inet gave me that knowledge. And would it not be great if a similar design could be done on 101 next to the Marin Civic Center? What an addition you could make to your super collection of the Center photos. Cheers! I’m glad you were not driving. It might be a great shot but having a wrecked car does not sound like an equal pay off. The other image is outstanding. I think there was significant use of filters to get the final produce. Could be, I suppose. I did find another version on an AU news site that showed the Melbourne cityscape on the left side horizon while the one MS used looks like this detail has been blurred out. The lines and curves in this are amazing! Yes, it is a really cool spot to drive through.